DEC has received a Brownfield Cleanup Program (BCP) application for a site known as 702 Nostrand Avenue, site ID #C224270. This site is located in the City of New York, within the County of Kings, and is located at 702 Nostrand Avenue, Brooklyn NY 11216. Comments about the application must be submitted no later than March 16, 2018. A copy of the application and other relevant documents are available at: Brooklyn Public Library – Brower Park Branch, 725 St. Marks Avenue, Brooklyn NY 11216 --and-- Brooklyn Community Board 8, 1291 St. Marks Avenue, Brooklyn NY 11213. The New York State Department of Environmental Conservation (NYS DEC), as lead agency, has determined that the proposed Dolomite Products Co., Inc. - LeRoy Quarry Expansion may have a significant adverse impact on the environment and a Draft Environmental Impact Statement must be prepared. Written comments on the draft scope will be accepted by the contact listed above until March 16, 2018. 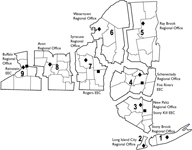 A copy of the draft scoping document may be viewed at the NYS DEC - Region 8 Office in Avon during normal business hours by calling the contact person above or during normal business hours at the LeRoy Town Hall. Electronic copies of the Draft EIS scoping document may also be obtained by request to the contact person listed above. DEC invites the public to comment about a proposed remedy to address contamination related to the 1030 East Dominick Street Site (Rome, Oneida Co.), within New York's Environmental Restoration Program. Public comments about the proposal will be accepted through March 16, 2018. A public meeting also will be held to discuss the proposal: March 8, 2018 at 6:00PM at Rome City Hall, 198 N. Washington Street, Rome, NY 13440. Click the web link above at "Additional Information" to learn about the site, the proposal, and how to comment. Project documents can be reviewed at: Jervis Public Library, 613 North Washington Street, Rome, NY 13440; phone: 315-336-4570 --and-- City of Rome, Attn: Diana Samuels, 198 North Washington Street, Rome, NY 13440; phone: 315-339-7646. DEC invites the public to comment about a proposed remedy to address contamination related to the 701 Lawrence and Martin Street Site (Rome, Oneida Co.0, within New York's Environmental Restoration Program. Public comments about the proposal will be accepted through March 16, 2018. A public meeting also will be held about the proposal: March 8, 2018 at 7:00 PM at Rome City Hall, 198 North Washington Street, Rome, NY. Click the web link above at "Additional Information" to learn about the proposal, the public meeting, and how to comment. Location: Brooklyn Borough Hall, 209 Joralemon Street, Brooklyn, NY 11201. This workshop will explore a plethora of topics including: the adaptation of two NYC parks to a changing environment; non-traditional green spaces; and the American chestnut in NYC. ISA and CNLP credits will be available. Early registration is due by March 8th.